We believe that commerce is impossible without community. Success is multiplied, not divided, and the more people that choose to participate in the economy, give back to their neighbors, and engage with their community, the greater level of success for all. We believe that shopping should be an experience, not a chore. Life is too short to be bored. If we’re not surprising, delighting, and engaging you as customers, we’re doing it wrong. We believe that a few things, done really well, are better than a multitude of sub-par offerings. Quality trumps quantity, every time. We believe that dressing well is a mindset. Style is personal, and your clothes should make you feel good. If you feel good, you look good, no matter what you’re wearing. We believe in craft and chivalry. We believe in the value of all people — our investment in ourselves and in others is our legacy. Click here to read the previous post in CRAFTING THE CITY BEAUTIFUL. Fast forward one hundred and twenty five years to 2016, and my grandfather had just passed away. One rainy Saturday in May, I was digging through what seemed like an endless array of belongings stored in my grandparents’ basement. My grandparents were Depression babies, and they never threw anything away. Everything had a use, and a reuse, and endless potential, because it could be the last time anything of similar significance came their way. This transferred into their adult lives – my grandfather as a construction superintendent and my grandmother as a teacher – and on this particular Saturday, I was sifting through the expansive collections of construction detritus that my grandfather had compounded over the years. As long as I could remember, that basement was his version of a museum. He had leftover building materials and tools from every job he’d ever worked on, and could wax poetic about the trials and tribulations that accompanied each and every project. He used to tell me in detail about the way the floors were laid in the Lauren Rogers addition, or exactly how and why the crane failed the day they were trying to place the First United Methodist steeple. He helped build the Laurel we know today, and never missed an opportunity to talk about it. I never paid enough attention. I’d finished high school here and hadn’t wasted a minute getting away. I went on to architecture school at Mississippi State; I came from a family of builders, of one stripe or another, and architecture seemed the logical way to marry my creativity with my attention to detail. I finished, and moved further away to begin my career. I learned quickly that a life spent in front of a computer was not what I wanted. I went back to grad school, and got an MBA. I chased that with a stint in sales, which kept me on the road constantly, and from which I was taking vacation to help my family pack up my grandfather’s home. Back to the Saturday in my grandfather’s basement. In the farthest shadowed corner of the basement – a place I’d always been scared to go as a child – I was moving out old wood, boxes, and abandoned furniture components when I hit a layer of papers covering an old drafting-style table. After bringing in more light and uncovering the entirety of the tabletop, I realized what a treasure I’d just uncovered. 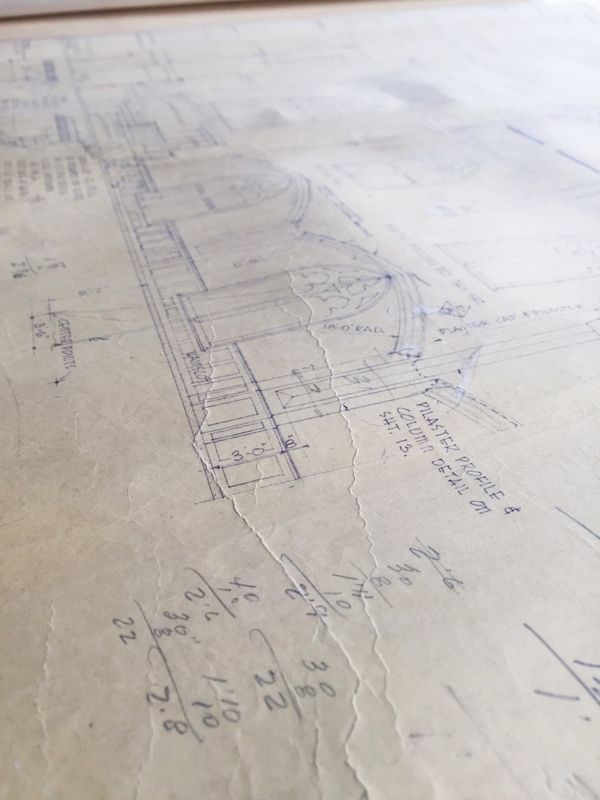 In the dark, moldering corner of my grandfather’s basement, I found architectural plans for a handful of the most pivotal projects of my grandfather’s career — First Baptist Church’s sanctuary, the Laurel Leader Call building, Laurel Fire Station Number One, and several others that he spoke of often. My architecturally-inclined heart skipped a beat. My grandfather literally built parts of Laurel, and I’d found the instructions he used. These buildings had shaped my life, and my experiences of my hometown. I realized then that my architectural aspirations had always been about building, but that building something didn’t necessitate construction. The only way to build a place is to give its people a reason to stay, and give everyone else a reason to want to. Laurel is thriving again. It’s an uphill battle, but it’s one being waged by visionaries of all stripes who know that Laurel can be the progressive, innovative and culturally relevant place that our “Iowa men” intended. Guild and Gentry was envisioned as an homage to our city’s founders, both the named and unnamed in the annals of Laurel’s history — the men who built this town with their hands, hearts, and minds. Laurel’s past offers us a glimpse into what’s possible for her future — craftsmen, innovators, visionaries, and makers working together to foster creativity, build community, and leave this town better than we found it. Click here to read the FIRE + FORTITUDE series. The sun was hot, but the massive pines grew too close to let the light in. They didn’t throw limbs until twenty or thirty feet high, creating a vaulted, green cathedral that smelled of pine sap, smoke, and sweat. This was church, and the men worshipped at an altar of yellow pine. In the Reconstruction South, progress was dependent on timber. Timber manufacturing began in our stretch of the Piney Woods in the late nineteenth century with the expectation of a Yankee-driven lumber boom. John Kamper and A.M. Lewin, seeing a wide open market, founded Kamper and Lewin Manufacturing Co. in the late 1880s. They built two mills in the area and began clearcutting and processing yellow pine. In 1882, the USPS began the process of establishing mail stops at the lumber mills popping up all over the Southeast. This directive landed on the desks of Kamper & Lewin Manufacturing Co., with instructions to name their two mills— one on what is now First Avenue, and one in the already-named community of Kingston, a few miles north. Tasked with identifying the settlement that had grown up around their as-yet-unnamed mill, the men each tried to name the community after the other. Both men immediately declined – neither Kamper nor Lewin wanted his name attached to such a forgettable place. Faced with the impending deadline to name the outpost and establish mail service, they visited the mill in search of inspiration. They walked the rails, circled the camp, and stood under the pines. In desperation, they finally named our future City Beautiful after the first thing they’d laid eyes on when the train stopped – a stubby patch of mountain laurel growing between the tracks and the trees. The men submitted their mill’s name — “Lawrell” — to the USPS. The community grew, and mail began to arrive. The small mill town gained the attention of the national Postmaster General, John Wanamaker, who was irked by the misspelling. He officially changed the name to Laurel, and effectively erased the incorrect spelling from Mississippi geography. She was small, and unimpressive to the naked eye, but her potential was visible to those who would see it. Kamper was not our visionary, though. When he crossed paths with father and son Silas and George Gardiner, and their cousin, Charles Eastman, on a train platform in Slidell in 1891, he thought he’d found the perfect way to get rid of the mill he wouldn’t give his name to. The three “Timber Cruisers” were visiting from their homes in Iowa, searching for timber investments in the pine-rich South. Our “Iowa men” agreed to visit Laurel with Kamper. What they were shown was a run down mess: a ramshackle mill with an even shabbier settlement. What they saw, though, was potential. The virgin pine forests in and around Laurel were impossible to resist, and for four dollars an acre, the Gardiners and Eastman purchased 16,000 acres of land. Later that year, they packed up and moved their homes, families, and hearts to the Piney Woods of South Mississippi. They may have been timber men by trade, but they, and their families, were builders at heart. The first generations of Gardiners and Eastmans, and later, their cousins the Greenes, saw no reason why a small encampment in the deep woods of Mississippi – the poorest state in the post-Civil War Union – couldn’t be a bastion of culture, progressivism, and intellectualism. While most timber barons kept homes for their families in larger, more metropolitan cities, and traveled back and forth to the lumber camps, these men chose to settle their families here and bring the urbane with them. They contracted the foremost experts of the time, on everything from education to park design, and poured a significant portion of the money they made from the land back into Laurel. They built a place worth calling home. Click here to read the next post in CRAFTING THE CITY BEAUTIFUL.